“Turn left in 198km,” the SatNav spoke to us, on a road that was straight, so straight except for when it curved a little. And it rained, and rained, and rained, and rained. And then it didn’t rain. Then it rained again. But despite the bar-briefly relentless rain there was so much that emerged from the clouds that filled us with awe. 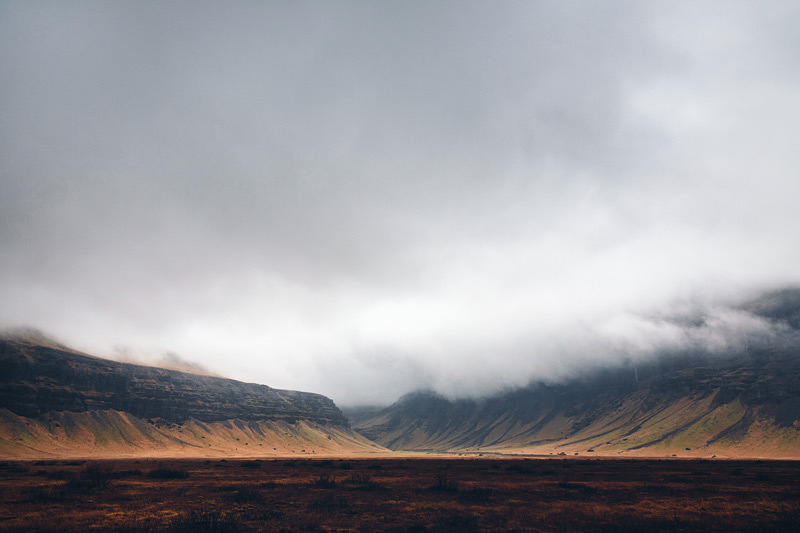 The variety, the sheer variety of landscape in Iceland, the variety and vigour with which it changes, often-times in an instant between one blink of the eye and the next; the sheer variety overwhelms, marvellously. It commandeers your perceptions; your perception of place and perception of self within that place. One moment a flock of incongruously rounded green hillocks that you would as much expect to see Dipsy or Po emerge from as you would an elf. Then suddenly a sea of staccato fractal ridges that look like pain ensconced in green velvet gloves. A little further on, equally as suddenly, what appears very much to have the same type of structure as the last but somehow softened, more rounded, reduced, an echo of the visual passage that had passed shortly beforehand, pain worn down to lingering acceptance. Then, an unrelenting flatness of black, stretching on for miles. In the distance clouds that on closer approach emerge as mountains and mountains that on closer approach emerge as clouds. As we summited the brow of another headland and the next view was unfurled in front of us, a magnificent banner draped from sky down to sea, a voice softly underscored with awe issued forth from the passenger seat to my right. “I feel so small,” said Amelia. I’d had it in mind for quite some time to take her on a memorable journey of some form or another before she reached an age where she’d no longer be interested in hanging out with her dad. “I’ll never get bored of hanging out with you, Daddy!” she declared when I’d first raised this notion with her. We’ll see, I thought to myself :~) A specific plan manifested itself when Nichola and Marcus got engaged. Over a number of years I’d seen images made by a variety of wedding photographers that had travelled to Iceland, sometimes images relating to weddings, sometimes images from personal travels. I’d always found myself thinking what a beautiful place it looked but there are many beautiful places in the world, many on our own doorsteps even. Then in February of 2016, Nichola and Marcus travelled to Iceland with a small group of wedding photographers and videographers. During the trip, one day, the two took a turn adopting the role of models for a staged couple’s shoot, the backdrop a flotilla of icebergs, the stage an expanse of snow and blue water. Un-staged, Marcus dropped down onto one knee in the middle of the shoot and proposed to Nichola. The video and photographs were a joy to see. I sent Nichola a message to congratulate her and related to her this notion that I’d been formulating of a journey with Amelia, telling her that her images from Iceland had tipped me towards choosing that country as the destination. She asked when I planned to go. I told her that most likely it would be during the half-term school break in the February of the following year, shortly after Amelia’s eleventh birthday and to mark that occasion. It transpired that she and Marcus would be returning to the country during the same week, to get married. Nichola asked if I would photograph the wedding. And here Amelia and I found ourselves, a year later, in Iceland. Over the space of the twelve months between choosing the destination and first setting foot in the country, she’d evolved from child to nascent teenager. I did wonder more and more how she’d take to hanging out with Daddy 24/7 for, well, the 7 part of the equation as well as the 24. Turns out it would be brilliantly; an excellent travelling partner for a grand adventure, which we agreed to refer to it all in place of ‘holiday’ as there wasn’t enough in the way of lay-ins and general rest for the latter term to legitimately apply. So brilliantly in fact, we’re now planning our return visit to the country to celebrate a landmark birthday of my own later this year. Let’s talk about the weather, because that’s what we do. In fact I’d rather talk about Hannah & Aled and their wedding which I will indeed do but talking about their wedding wouldn’t be complete without talking about the weather. 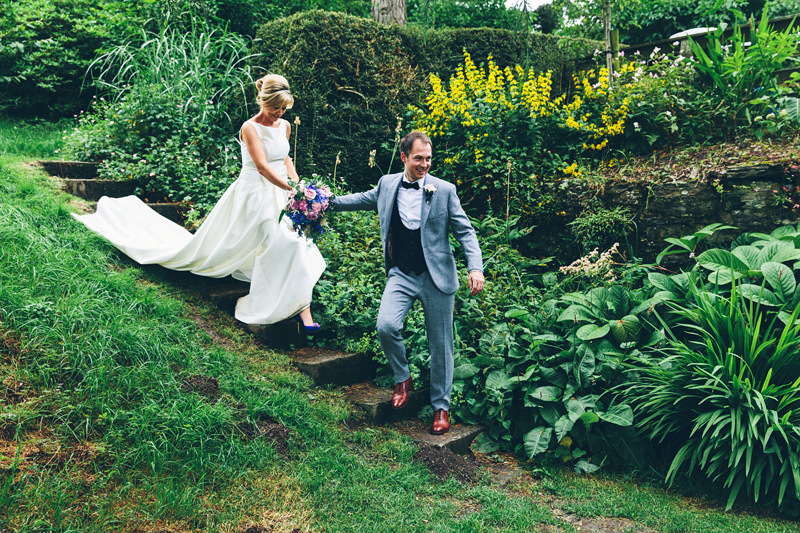 Hannah & Aled wanted an outdoor wedding ceremony. They really wanted an outdoor wedding ceremony. 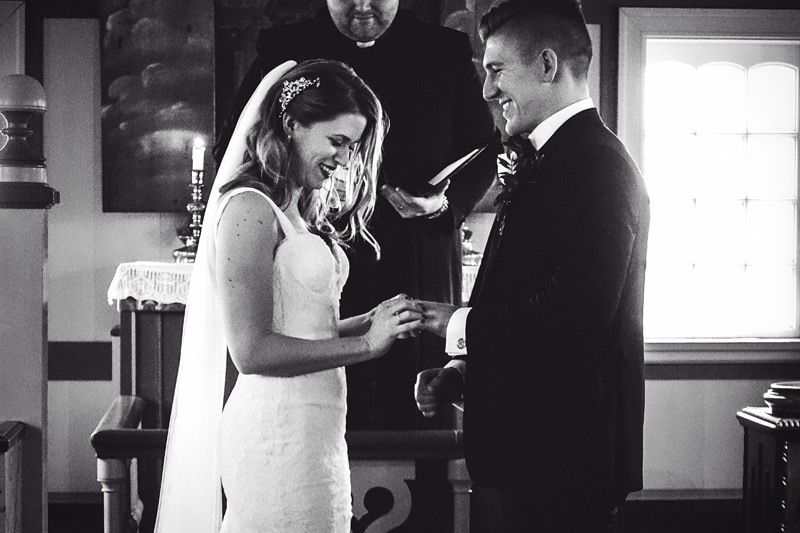 They had a Plan A, a ceremony beneath a rocky fountain waterfall in a wooded garden. Naturally they had a Plan B, too, should the weather not allow for Plan A to take place. Plan B would see the ceremony take place… outdoors, in a flag-stone paved courtyard imbued with classical architectural character. Outdoors. Still. 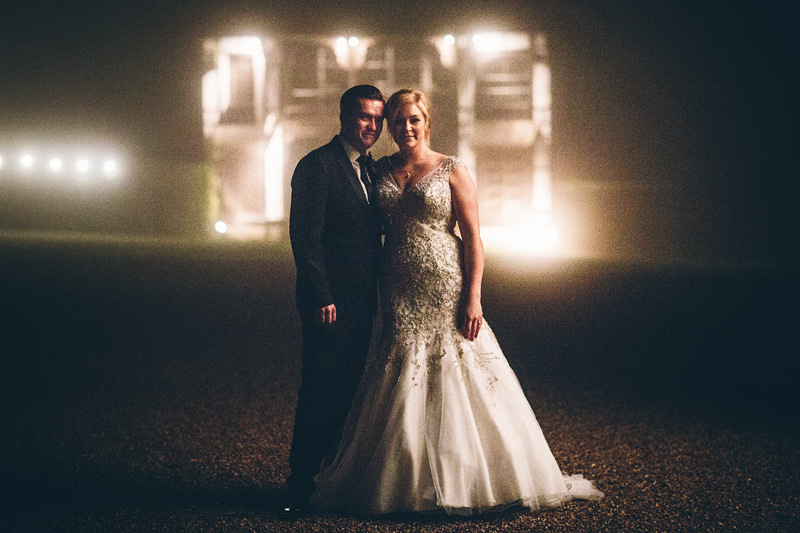 There was also a Plan C with a large entrance hallway at their venue, Walcot Hall, already filled with chairs and an aisle down the middle but really Plan C was Plan Z, with no other plans to fill the gap between it and A and B. Really, it wasn’t even a Plan Z to Hannah & Aled’s minds. It was Plan W. We’re not using that plan. We’re getting married outdoors. As far as I’m aware, Hannah & Aled live in an abode that would be easily recognised as a construct that serves the purpose of human habitation. I haven’t seen it myself but I had an address to send their final image set to that read like that attached to such a habitation. Their spirits though are such that I don’t think can be bound by walls and ceilings, in the slightest (and whilst there were four walls surrounding their evening celebrations on the day of their wedding, I’m sure it was a good thing that the ceiling was a particularly high one because any lower and the roof would have been in danger of being lifted clean off!). So married outdoors it had to be. My daughter, Amelia, turned eleven this January. During the February school half-term break we embarked on a grand adventure together, spending a week in Iceland. The decision to make Iceland the location for this adventure had been triggered by our seeing Nichola & Marcus’s photographs and videos from a trip they had taken to the country last February, in particular those featuring Marcus’s proposal to Nichola on the shore of the glacier lagoon at Jökulsárlón. Our trip would also coincide with Nichola & Marcus returning to Iceland to marry, with a ceremony at Búðir Church in the Búðahraun lava fields in Staðarsveit and a visit a few days later to Jökulsárlón, to the very spot that they had first become engaged. Nichola & Marcus asked me to photograph these two occasions and as she would be my assistant, Amelia suggested that I buy her a camera for her eleventh birthday. So I did; a nice little compact camera with enough in the way of features for her to grow in to. As yet I’ve provided her with no direct instruction in photography, made no attempt to influence choice of subject matter, composition or timing; I was keen to see how she would work her way into using the medium and all that I have shown her is how to charge the battery in her new camera. Everything else she has thus far worked out for herself. Every photograph in this blog post was taken by her. Originally I’d had it in mind to include a few of her images alongside my own when it came time for me to blog this wedding. When I saw what she had produced though, I knew immediately that I wanted to give her work a blog post of its own. I am amazed by what she has created. I’m thrilled to have this new insight into the way that she sees the world. I was impressed by her professionalism, calmness and perseverance throughout and am immeasurably proud of her for this and for all that she is. I sense that it might well be me assisting her at some point in the not too distant future! In opening his speech on his and Julia’s wedding day, Simon pointed out that whilst it was considered traditional for the groom to make his thanks for having been welcomed into the bride’s family, he didn’t need to employ such words at this juncture as he had been included immediately and fully in that family since his and Julia’s relationship had begun quite some years earlier. His saying this struck a resonant chord in me; it spoke clearly of a family that act in an inclusive manner, open, warm-hearted and welcoming and I myself have enjoyed and appreciated that shared spirit in my encounters with them now dotted across several years. I had first met them in early-2010; a family gathering of seventeen – sixteen humans and one characterful dog – joined to celebrate three birthdays; an eightieth, a fiftieth and a seventeenth. Julia was then working as an events coordinator at a lovely rural Dorset venue – Holton Lee – where the year before I had photographed one of my earliest weddings and having seen my photographs from that wedding she asked if I might be interested in photographing a family gathering that they had planned. Accustomed already to immersing myself amidst throngs of people up to a hundred strong or more, I wondered if my presence as a stranger, as a photographer might prove a little unsettling to a relatively smaller and tight knit group but all seemed wholly accepting of my presence from the off, were thoroughly welcoming and they proved to be the most enjoyably enthusiastic subjects that I might wish for as I went about my craft. It was a great pleasure indeed to experience the dynamic of this group. Five years later, I had a throughly enjoyable time in photographing the wedding of Julia’s sister when Nicola married another Simon and it was fantastic to be able to do my thing amongst these same people once again. Some months either side of that wedding I also had the pleasure of working alongside Julia at a couple of weddings, she in her capacity as a wedding planner demonstrating complete command of the role wrapped in a demeanour imbued with grace. 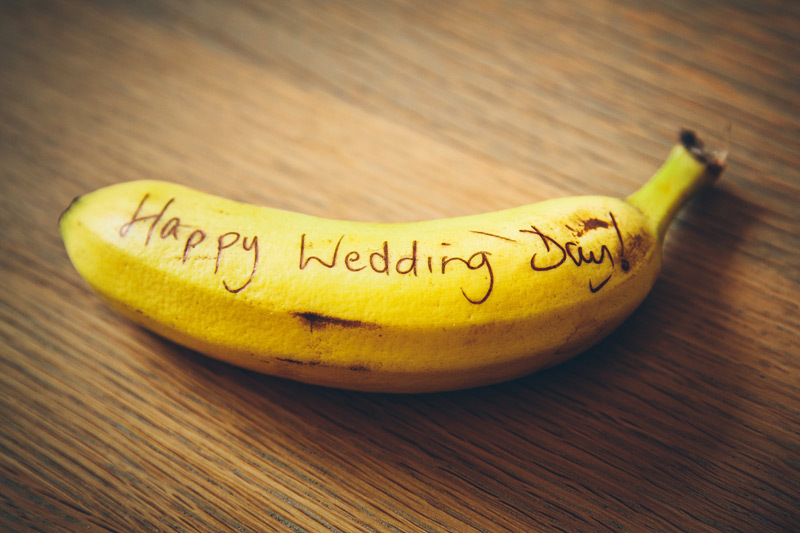 2016 was the year that the wedding banana became a thing and may it emerge as a tradition that stands the test of time. My research into the fruit – for the purposes of producing this blog post though subsequently I felt that it was a journey best engaged with on an individual basis so I’ll leave the pleasure of discovering all the facts in hands with such interests – has convinced me that I need to eat more of them. That aside, it’s great to see such innovation at work and my thanks for my exposure to this particular innovation goes to whichever of Laura & Tim’s friends presented them with such a fine gift on their wedding day. I’m not sure that it is something that would sit well, in the long term, in a frame but a framed photograph of the artefact should do the trick just nicely. I travelled 6774 miles by road and a further 2020 miles by air throughout the year finding myself in East Sussex, Somerset, Gloucestershire, Cornwall, Suffolk, Leicestershire, Cornwall again, the Venetian gulf, Dorset, Cheshire, Shropshire, Warwickshire, Gloucestershire a second time, Buckinghamshire, another part of Dorset, yet another part of Dorset, County Down, Bedfordshire, London, Hampshire, Somerset again then Wiltshire. I enjoyed the variety of landscape. I’m looking forward to driverless cars achieving ubiquity.